This apple chutney is a very flavorful topping that works great on pork or fish. Sometimes I'll even use it as a savory topping on desserts. The apples are cooked in a bourbon, maple syrup, chipotle and thyme mixture. After a brief puree they are ready to go. For a thicker chutney, or if the apples release too many juices, they can be briefly simmered before pureeing them to reduce the juices down. You can leave the skin on or peel them for a more refined presentation. Depending on your final use of the apples, they can be cooked for anywhere between 1 to 3 hours. For this recipe I do 11/2 to 2 hours at 185°F (85°C) so they still have some bite to them. 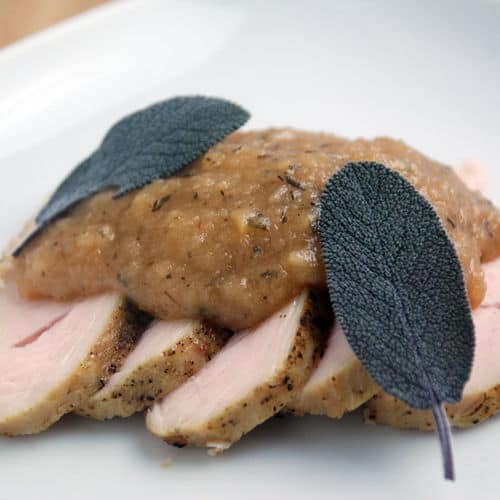 If you would like more information about the modernist techniques, ingredients, and equipment used in the sous vide bourbon-maple chutney recipe you can check out the following. Place the apples in a sous vide bag, trying to keep the thickness of the bag less than 1" (25mm) for even cooking. Whisk together the remaining ingredients then pour over the apples. Seal the sous vide bag and cook for 90 to 120 minutes. Once cooked, briefly blend the apple mixture to combine it into a thick puree then serve. The addition of 0.1% to 0.2% xanthan gum helps hold the chutney together and thicken it. Just blend it in during the final pureeing stage. This apple chutney is a very flavorful topping that provides an extra savory punch to a pork or fish entree. 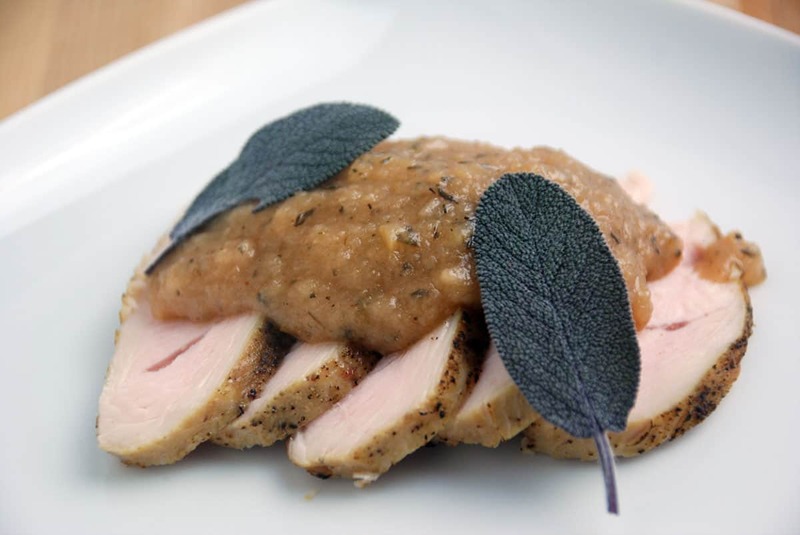 This recipe sous vides the apples in a bourbon, maple syrup, chipotle and thyme mixture.